In Robert Park’s 2000 book titled Voodoo Science, Park debunks pseudoscientific claims as well as bogus therapies. Being a physicist, Park easily explains how many pseudoscientific claims and therapies aren’t verifiable or even scientifically possible. He tackles topics such as UFOs, infinite free energy, unsubstantiated therapies, and homeopathic remedies. Not only does Park scientifically explain why these claims are essentially fraud, he also describes the psychological reasoning behind what causes the average consumer to fall for such quackery. 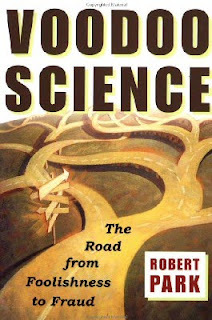 Park uses his background in physics to explain why many pseudoscientific remedies simply do not work, but does so in a way that the average person can understand. You don’t have to have a degree in physics to understand Park’s book, which makes it an easy and interesting read. I thoroughly enjoyed reading about all of the debunked homeopathic remedies, but one of my favorites was about magnet therapy. Park bought a magnet therapy kit at his local department store that claimed to be 1600 times greater than the earth’s magnetic field. The magnets were supposed to reduce pain and were attached using Velcro straps, but Park found they were no different than refrigerator magnets and once you put them in their Velcro pouch, it reduced their magnetic field to the point were they couldn’t even hold a paper clip, let alone penetrate the skin. I though Park’s experiment was interesting because it was simple and easy. Anybody could buy a magnet therapy kit and see for themselves that just by following the directions the magnets aren’t nearly strong enough to do much of anything. After reading about magnet therapy, it reminded me of the Q-ray bracelet from the textbook. The Q-ray bracelet also claimed to reduce pain without the use of traditional pain relievers, instead using a natural and “holistic” way to reduce pain. Both the Q-ray and magnetic therapy kits have been proven to be bogus, but people still spend money on similar therapies seeking any kind of relief. Many people spend countless dollars looking for relief in natural and holistic remedies, yet many of these remedies never undergo any kind of scientific testing to see if they are actually effective. I think if the average consumer read this book, they would be much more hesitant to spend their hard earned cash on untested and unsubstantiated therapies. This book truly shows that if it sounds too good to be true, it probably is.